According to Herbie, The Love Bug‘s owner, several “communal” cats live along Panorama, which circles round to Adams Ave. at both ends. 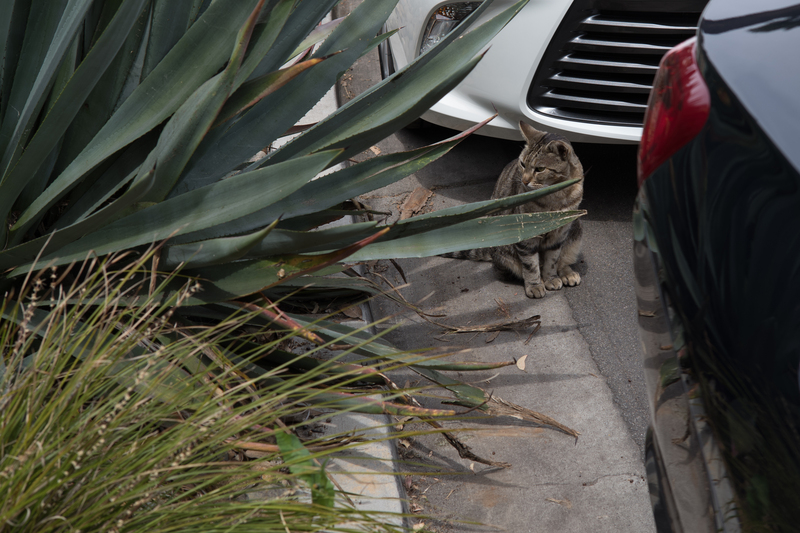 Several neighbors put out food for them; the tiger tabby that I encountered on April 15, 2018 is among their members. Herbie’s caretaker couldn’t give me a name for the female shorthair, who may have none. But she’s a long-time fixture, as are several others along a street where coyotes climb out of the canyon hunting for food (yikes, like cats). I dub this mature madam: Roadie, because she hung out between two cars and the sidewalk long enough for me to slowly approach and capture eight shots over two minutes. The Featured Image, taken with Leica M10 and Summarit-M 1:2.4/50 lens, is the last of the portraits. Vitals: f/5.6, ISO 100, 1/250 sec, 50mm; 1:56 p.m. PDT. Seconds later, Roadie crossed the street and slipped into a garage with cracked-open door. From the cat archives: Scruffy, Roly Poly, Woo, Skull, Biscuit, The Colonel, White, Chipper, Frisky, Stretch, Needy, Farfisa, Mates, Hunter, Pee-Pee, Blue, Blue Too, Bonded Pair, Patience, Fess, Jumper, Frenemy, Looker, Cozy, Scout, Lurks, Skit, Mini, Betty, Black and White, Stalker, Bell, Chill, Sammy, Scratch, Poser, Star, Grey and White, Watcher, Herman, Comet, Roman, Willow, Chub, Nimbus, Watson, Lilo, Kit, Pepe, Twilight, Sebastian, Spot, Booger, Ash, Veruca, Riley, Mellow, Bonde, Flower, Glass, Black, BeBe, Fang, Bruce, Siamese, Pounce, Tortie, Haiku, Fraidy, Peso, Daniel Tiger, Dusk, Stride, Dainty, Spry,Tabby, Betty Too, Still, Levi, Shadow, Sophie, Wink, Ferals, Momma, Charlie, Tux, Cool, Benny, Jellicle, Itchy Valentino, Goldie, Nine, Amanda, Siesta, ChaCho, Charlie, Too, Mika, Crystal, Seeker, Mittens, Dancer, Smokey, Monkey, Captain Blackbeard, Season, Maven, Tink, Chunk, Curious, Hanoi, Bella, Tarry, Guido, Maxine, Mr. Kitty, Peohe, Panda, Frankie, Sunshine, Twain, Willow, Too, Brawn, Reddy, Burglar, Laramie, Lupe, Bright, Tom, Charm, Buddies, Boss, Ohana, Seer, Fresh, Token, Lola, Carl, Bramble, Finny, Cal, Tipsy, Zander, Mew, Penny, Charlie (the Third), Bob, Apple, Persepolis, Sebastian, Too, Holiday, Snow, Desire, Luci, Torbie, E.T., Bushy, Cali, Precious, Gracie, STAR, Sky, Amble, Aylin, Lucky, and Herbie, The Love Bug.